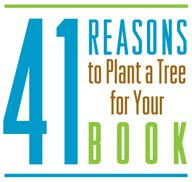 With more than 180,000 trees planted so far on behalf of readers, authors and publishers working with Eco-Libris, it's no surprise we think planting trees to green up books is only natural, but we also want to hear what readers think about it and why they believe planting trees for books is a good idea. Therefore, for 41 days, from March 13 culminating with Earth Day on April 22, Eco-Libris will publish the 41 best answers on our blog, one reply every day! We have great prizes courtesy of our partners to all the readers whose replies we'll publish, including a $25 gift card for Strand Bookstore, audiobooks from Simon & Schuster Audio (such as The Half Life by Jennifer Weiner, American Assassin by Vince Flynn and The Essence of Happiness by the Dalai Lama) and great green books, including books from the Little Green Books series, Planet Home by Jeffrey Hollender, Spit That Out! by Paige Wolf and The Story of Stuff by Annie Leonard . You can see the full list of the prizes on the campaign's webpage.